Making energy where the sun shines: Solar energy system installed at UCPath Center | Link: UCOP's e-newsletter | Stay Informed. Stay Connected. The UCPath Center (UCPC) in Riverside has it made in the shade – and in the sun. 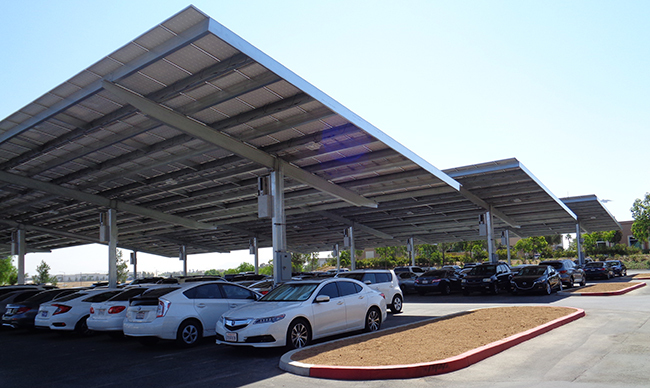 With the installation of a system of solar panels in the parking lot, electricity is being generated while parked cars are shaded. 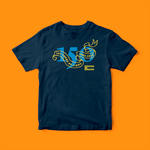 It’s a win-win for sustainability and employee comfort at the end of a hot work day! A collaborative effort by UCOP’s Energy and Sustainability and Building & Administrative Services departments along with UC Riverside, the installation is the first solar project installed at a UCOP site. Onsite renewable energy generation is an integral part of UC’s strategy to achieve carbon neutrality by 2025. Systemwide, more than 40 MW of solar has been installed at UC to date. By reducing the use of conventionally produced electrical grid power, the new UCPC solar installation will reduce greenhouse gas emissions of carbon dioxide by an estimated 6,000 metric tons over 20 years — equivalent to the emissions produced by 1,285 passenger vehicles in a year! As a bonus, the elevated canopy design provides shaded parking to approximately 40 percent of the main parking lot. That means cooler cars (and less use of air conditioning) when employees leave work. In addition to producing renewable energy, the project benefits UC by stabilizing electrical costs with a long-term fixed-price contract for solar power. No capital investment was required of UC; the new system was installed by SunPower. UCOP will purchase the electricity that is produced from the system over time, so actual savings will depend on total consumption and usage patterns for the building. Curious to know more about this project? Contact Cynthia.Clark@ucop.edu or Jihee.Lee@ucop.edu. Great story and as a UCPath Center staffer, we greatly appreciate the solar panels in our parking lot. This is awesome. I would love to see every UC parking lot have solar to generate energy and reduce climate change from sunlight super heating the black top of parking lots. thanks for this!